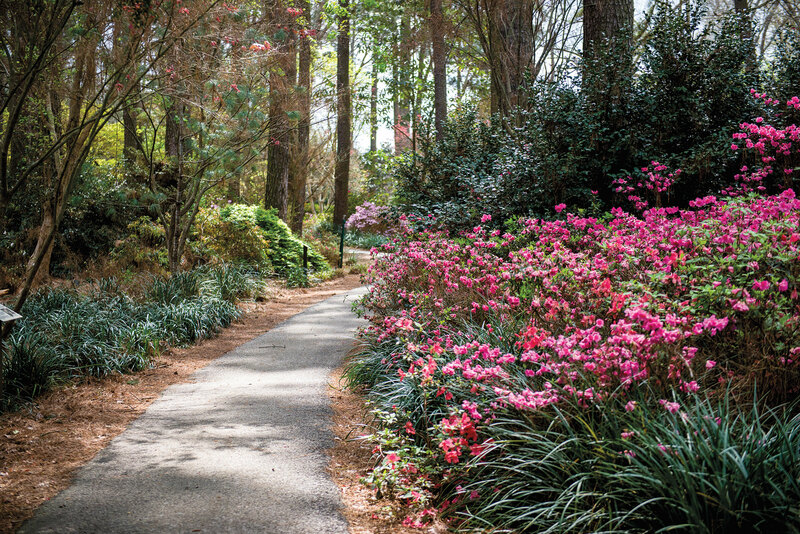 On the SFA campus, the Ruby M. Mize Azalea Garden boasts 500 varieties of azaleas and more than a mile of walking trails across 8 acres. In early spring, Nacogdoches wears its azaleas like a princess wears her jewels: always and everywhere. It’s hard to find a corner of this small East Texas city not bedecked in plump, round blossoms of purple, pink, red, yellow, orange, and white. The Nacogdoches Azalea Trail takes place in March and April with specific dates pending the timing of the seasonal bloom. But when we talk about Nacogdoches being in full bloom right now, we’re not just talking about flowers. With restaurants, shops, and attractions springing forth, new seeds of cultural vitality are sprouting in the town’s flourishing beds of history. Set in the Piney Woods and invigorated with the youthful spirit of Stephen F. Austin State University, Nacogdoches entices visitors year-round. 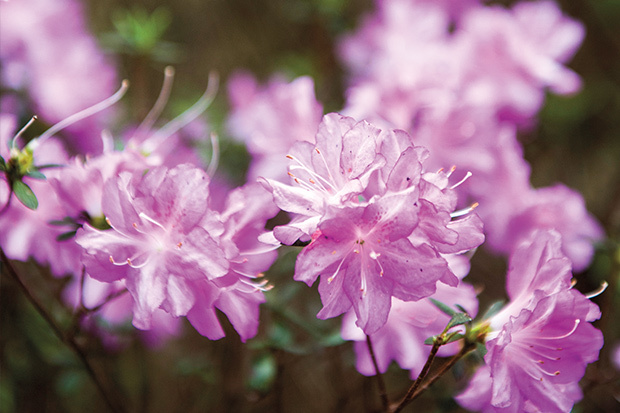 But spring is a grand time to explore because of the Nacogdoches Azalea Trail, which is not so much an event as a month-long opportunity (roughly mid-March to mid-April) to drive 25 miles on three self-guided routes in and around the town. 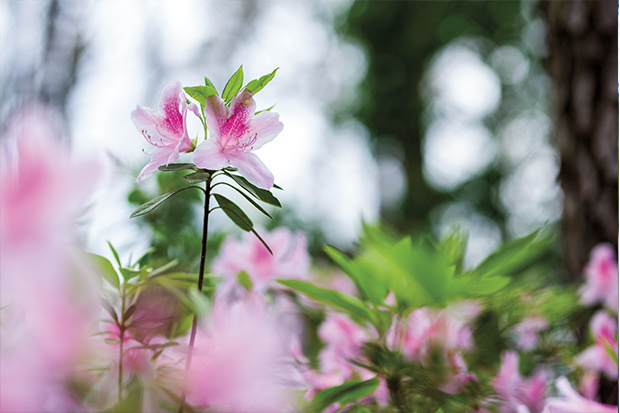 The trails wind through residential areas, the SFA campus, and the city’s gardens, providing views of both bountiful azalea blooms and Nacogdoches’ historical character. Glenn Dale azaleas line a path through the Ruby M. Mize Azalea Garden in early March of 2017. Containing 46 beds, the garden is home to over 7,000 azaleas. Nacogdoches lays claim to being the oldest town in Texas. The Caddo tribe lived in the area as long ago as 1250, evidenced by the excavation of bones and pottery from earthen mounds found along creeks near downtown. Franciscan priests established a mission here in 1776 to convert the Nacogdoches natives, leading to the founding of Nacogdoches pueblo three years later. Other Texas towns might quibble about which is the “oldest,” but one thing’s irrefutable: Nacogdoches deeply values its past. Ruby M. Mize Azalea Garden is at 1835 N. University Drive. Call 936-468-1832 for group tours; sfagardens.sfasu.edu. The Fredonia Hotel is at 200 N. Fredonia St. Call 936-564-1234; thefredonia.com. Front Porch Distillery is at 7905 US Hwy 59 S. Call 936-564-3999; frontporchdistillery.com. Sterne-Hoya House Museum and Library, 211 S. Lanana St. opens Tue-Sat 10 a.m.-4 p.m. Free. 1-4 p.m. Admission costs $10 for adult guided tours, $5 for child guided tours, and $4 for self-guided tours. 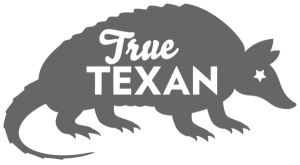 Call 936-564-6631; millardscrossing.org. Sat 10 a.m.-5 p.m. Call 936-468-5500; art.sfasu.edu/cole. 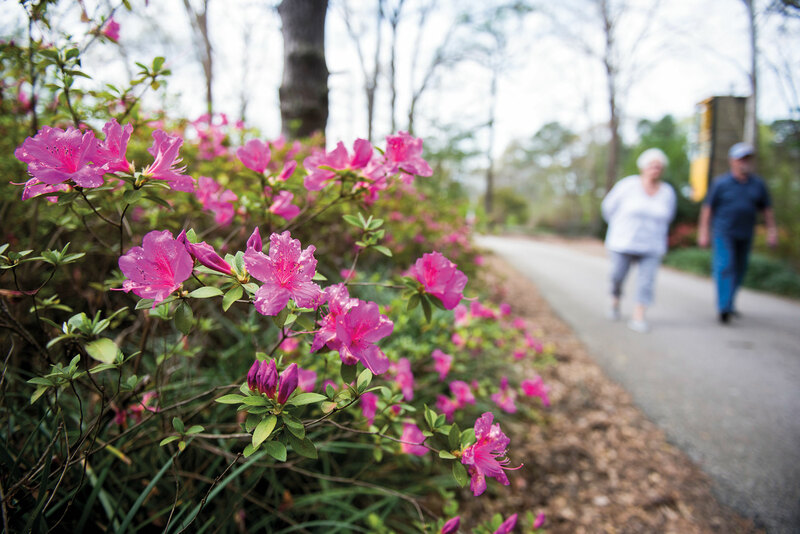 The crown jewel of Nacogdoches’ gardens, the Ruby M. Mize Azalea Garden on the SFA campus, brims with some 7,000 azaleas, and paved paths offer a welcome chance to get out of the car and do some walking. You’ll find about 500 varieties of azaleas in the garden, but keep your eyes peeled, too, for Japanese maples, rhododendrons, and camellias. During the Azalea Trail, the garden hosts free tours, as well as lectures, tea parties, and plant sales. 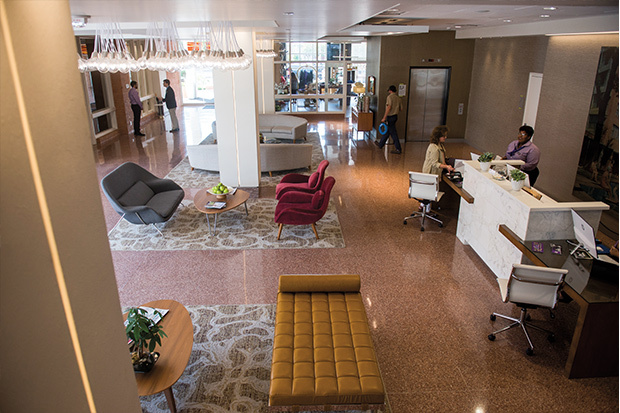 If you’re planning to visit when the azaleas are in bloom, you’ll want to book early at The Fredonia Hotel, which provides an excellent example of an embraced past reinvented as a cutting-edge present. Built in 1955 and completely renovated for its 2017 reopening, the Fredonia is named for an 1826 rebellion during which area settlers briefly declared themselves independent from Mexico as the Republic of Fredonia. The Fredonia pays homage to its midcentury roots with curvy furniture and décor colored lime green and aqua, but the new rooms also offer the latest in amenities, including top-flight bedding, 50-inch flat-screen TVs, and an abundance of electrical outlets and USB plugs that travelers crave. The hotel’s Republic Steakhouse quickly established itself as the place to go in Nacogdoches for a perfectly cooked steak. A new crop of Nacogdoches restaurants is also repurposing old structures, showing off the exposed brick of buildings originally erected in the 1800s and early 1900s. Opened a couple of years ago, Maklemore’s Ale House & Bistro garnered instant popularity with its selection of draft and bottled beers and live music many nights. You can’t go wrong with Maklemore’s juicy hamburgers with the all-American works—mustard, onion, tomato, lettuce, and pickles. Then there’s Liberty Bell, a wine bar that opened in 2013 in a brick building that dates to the 1880s. 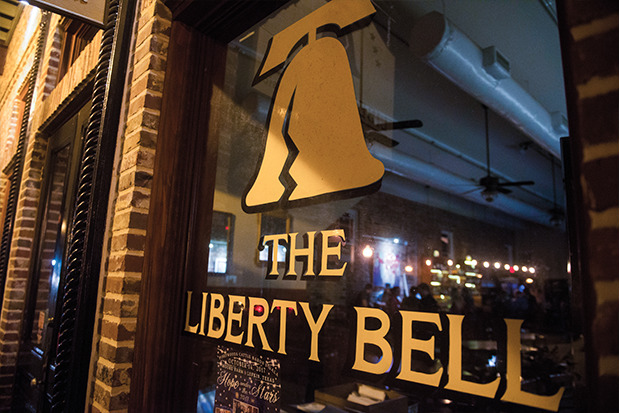 The Liberty Bell hosts frequent songwriter meet-ups and live music, but many patrons come for the food. Brunch means dishes like chicken and waffles served with eggs, maple syrup, and a side of ultra-creamy, cheddar-topped grits. Try pairing your meal with a glass of Vermentino—a fragrant white wine with pineapple notes—made by the newly opened local vineyard Naca Valley. Dinner in yet another historic brick room, Auntie Pasta’s, within a turn-of-the-century railroad supply building, offers entrées like a beefy square of lasagna swathed in slightly spicy marinara and mozzarella, and beverages like the light and crisp Banita Blond, an ale crafted by yet another new establishment, Fredonia Brewery. The brewery, like Naca Valley Vineyard, opens to visitors, but only on Saturdays. Any day of the week, though, you can find these local products at Nacogdoches restaurants, a sign of mutual support among local establishments. Town and gown mix happily in Nacogdoches, with everyone aware of what a boost the city gets from the university, and vice versa. Town and gown mix happily in Nacogdoches, with everyone aware of what a boost the city gets from the university, and vice versa. Brad Maule exemplifies the synergy. An SFA graduate probably best known as the long-running character Dr. Tony Jones on General Hospital, Maule is now a lecturer in the university’s School of Theatre and a founding board member of the Nacogdoches Film Festival, a February event that showcases Texas films, particularly those with East Texas ties. Local business owners, of course, value the college students and professors as customers. John D. Bradford is a good example. A Stephen F. Austin banner hangs from a tin roof above the distilling tanks at his Front Porch Distillery, which he opened with his four daughters in late 2016, creating it from an old catfish restaurant on the outskirts of town. While he brews up batches of whiskey, rum, and vodka, his daughters mix creative cocktails such as a blend of moonshine with lime juice that approximates a margarita. 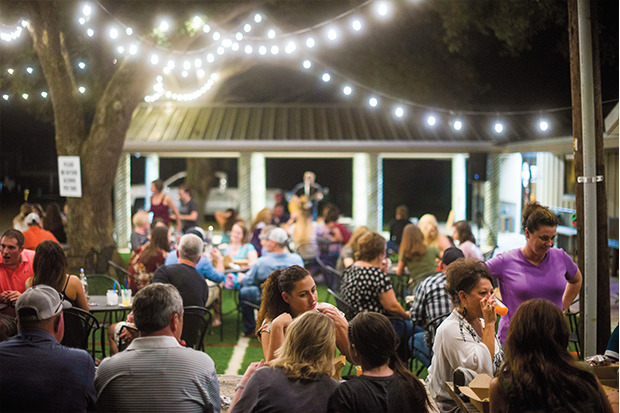 The place jumps with live music on Friday and Saturday nights, and guests spill onto the front porch, where iron patio tables and picnic tables sit atop repurposed football stadium Astroturf. 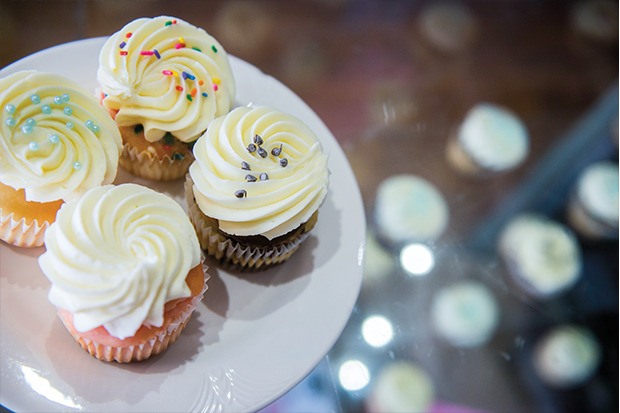 Downtown, new businesses such as Blue Horse Bakery (serving deftly decorated cupcakes) and The Bosslight bookstore (plenty of Texas authors on the shelves) share the azalea-festooned brick streets (paved in 1920) with longtime favorites. Return visitors will remember shops such as Heart of Texas Gift Gallery, where you can enjoy a Coke float while shopping for wind chimes, and Glass Castles Stained Glass Studio, which created many of the city’s church windows and offers lessons in making stained glass. For more on Nacogdoches’ rich history, stop by the Charles Bright Visitor Center—ringed by azaleas, of course—to explore its museum exhibits. Inside the 1918 building, which served as a post office and library in the past, you’ll find historic photos, a model of a steamboat like those that once plied the Angelina River, and an exhibit about the city’s first oil well, drilled in 1866, claimed as the state’s first oil well. The visitor center offers a brochure for a historic walking tour that includes a Caddo mound; the Oak Grove Cemetery, which contains the remains of four Texas Declaration of Independence signers; and a dozen houses dating to the 1800s. One of the most striking is the Sterne-Hoya House Museum and Library, which was built in 1830 by Nicholas Adolphus Sterne, a German immigrant active in both the Fredonia Rebellion and the Texas Revolution. Sterne eventually served in the Texas Congress. The pier-and-beam dogtrot house boasts the state’s first wine cellar (Sterne was a fan of Rhine wines) and hosted the likes of Texas heroes Davy Crockett and Sam Houston, who is said to have been baptized in its parlor. On the north side of town, Millard’s Crossing Historical Village displays 11 structures built in the 19th and early 20th centuries. Lera Millard Thomas, the first Texas woman to serve in the U.S. Congress and a great lover of history, assembled the structures, which include an 1837 home, a 1905 church, and a caboose dating to approximately 1914. Then there’s the 1880s former opera house downtown—originally red brick, it got a new brown brick façade and was renamed the Cason Building in 1923. The SFA School of Art has renovated the building into the Cole Art Center, featuring rotating exhibits. On the side of the opera house building, you’ll find a plaque about the Marx Brothers. Yes, Groucho and his brothers. They, too, have a history in Nacogdoches. In 1907, the brothers were a singing act, and they were holding forth in the opera house when, so the story goes, somebody’s mule or horse got loose and caused a ruckus out in the street. The audience that had come to see the brothers emptied into the street to observe the commotion. Eventually, people trickled back into the theater, where they found the singers spouting comic lines, for example, rhyming “Nacogdoches” with “roaches.” Happily, the locals decided to laugh instead of running the guys out on a rail. The Marx Brothers act was never the same. By now, you might be thinking: The Marx Brothers movie Duck Soup was about a nation called “Freedonia.” Fredonia is a significant name in Nacogdoches history, and there’s a Fredonia Street downtown near the opera house. Is there a connection? Nobody really knows, but it’s a heck of a coincidence. Austin writer Helen Anders likes exploring Texas small towns and cities such as Nacogdoches and, especially, getting to know their people. Dallas photographer Brian Maschino appreciates Nacogdoches’ quiet charm, especially the smell of pine trees in the air.